Students say they need the break. 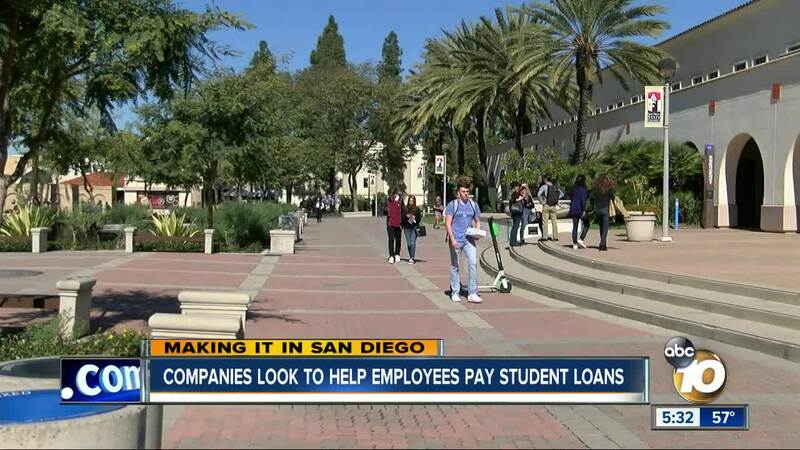 SAN DIEGO (KGTV) - San Diego Congressman Scott Peters is pitching a bipartisan plan to help workers pay off their student loans. Democratic Rep. Peters and Illinois Republican Rep. Rodney Davis have introduced a bill which would allow employers to make an annual tax-free contribution to employees to go toward student loan debt. Experts say about 70% of current college students will graduate with significant debt, while 25% of all adults are still paying off the loans they took out while still in school. "Young people are delaying their life decisions like buying a house, also starting a family," Peters told 10News to explain why he introduced the bill. "It's a drag on the economy." Under current law, employees are taxed on money for student loan repayment their companies offer. Peters' bill would allow those companies to contribute up to $5,250 each year. While the benefit for employees is clear, supporters say there are also advantages for employers. Peters suggests that offering student loan repayment as a benefit can help companies recruit talented new employees who will also have greater loyalty and willingness to stay remain with the company long-term. Peters tells 10News the bill is quickly picking up co-sponsors from both parties and an identical bi-partisan bill will be introduced in the Senate. Peters says he is more optimistic that the plan will pass with the House now under Democratic control than he was when a similar effort failed in 2017. While that bill moves through Congress, State Assemblymember Randy Voepel (R-Santee) is also trying to advance the same concept in the California Legislature.